To this day I still don’t have any idea how this book fell into my hands. 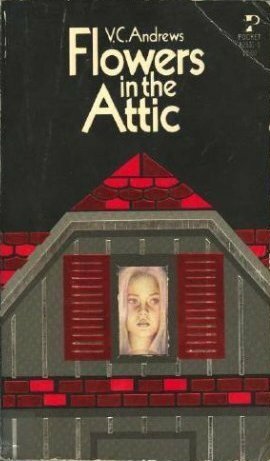 I was in elementary (primary) school when I first read it and if you haven’t, well you surely have heard about Flowers in the Attic. What’s the best part about this book? That fact that it’s the first in a series so there’s countless train wreck action! I will always reread this book and the first collections by V.C. Andrews. They’re my dirty little secrets that I’ve started since I was young and the writing is something you can’t forget. It’s shocking. I probably wasn’t at an ok age to read them, but I certainly would never, EVER let any child I know read these until they’re older. Just because I got away with the drama doesn’t mean I think it’s acceptable for others. Nevertheless I still love this classic horror novel. Here’s to the hushed behind the hands secret of the book world.